My site was only getting 400 visits per day when one of the biggest brands in my industry sent me a cease and desist and ordered me to hand over my domain. By pure chance, I’d picked a brand name very similar to a major company in the space. And it really was an honest mistake; when I first started my site, I literally named it after my own dog. Needless to say, the lawyers were not nice. And I was freaked out. But it really wasn’t that big of a deal (of course it would have been more painful if I’d done a ton of marketing under that domain, but I’d only been marketing for a few months). I just rebranded (using the strategies in this article) and 301’d everything to my new domain, herepup.com. Traffic dipped for about two weeks before bouncing back stronger than it was before. Along the way, I learned a lot about coming up with good blog names, and that’s part of what I want to share today. 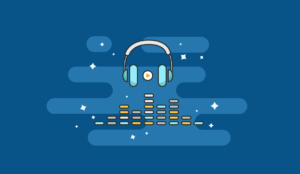 However, because it’s so tightly interwoven with a few key aspects of niche selection–specifically, how narrow or broad you should make your site–we’re going to talk about that, too. Before branding or angling, you have a very important decision to make: should you go broad or narrow? It’s an important question for new site owners, but even if you have an existing site, you should ask yourself, “Can I go broader than I am?” You might be able to. But before we can really decide, let’s unpack what each of those means. Broad = covering more of a bigger market. In other words, broad niches are more general and more inclusive. A broad niche might also cover lots of sub-niches. Easy examples of broad niches might be: cars, health, dating, or home improvement. These are all massive markets, and a site covering these markets in general would certainly be a broad site. The biggest benefit of going into a broad niche is that the potential is usually much greater, and that’s simply a function of market size. Bigger markets = more people, more topics to write about, and more products. Broader sites also tend to be easier to brand and easier to market. And that just makes sense, right? 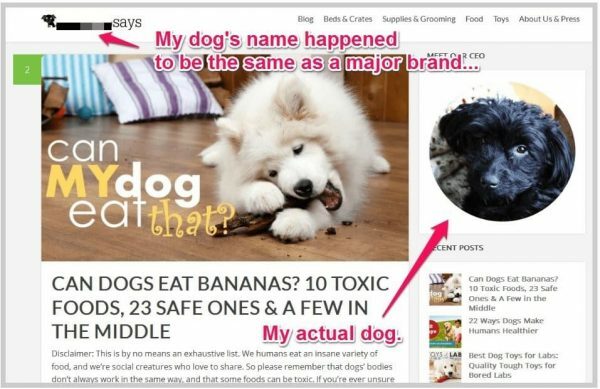 If your site is just about dogs, you can come up with a more general doggy-type brand, and you’ll likely have many more marketing opportunities than if your site covered, say, dog beds only. In my view, broad sites have one glaring con: low site-wide relevance. Now, this is a bit tricky. When people talk about relevance, it’s typically in the context of a single page. I’m referring to the relevance of the entire site’s theme. 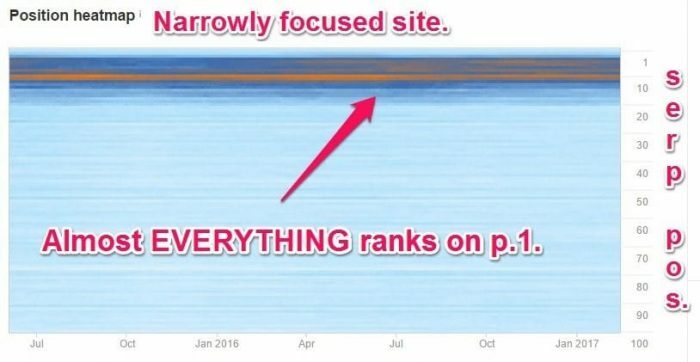 And while there’s not much hard data on how the “broadness” of a site affects rankings, there’s plenty of evidence about how siloing can boost rankings by giving google more tightly structured themes. After learning about siloing, I started to notice that narrowly focused sites functioned like silos. Un-siloed broad sites did not. This is easiest to see in the position heatmaps, an Ahrefs (our review) feature that shows where your keywords are ranking. 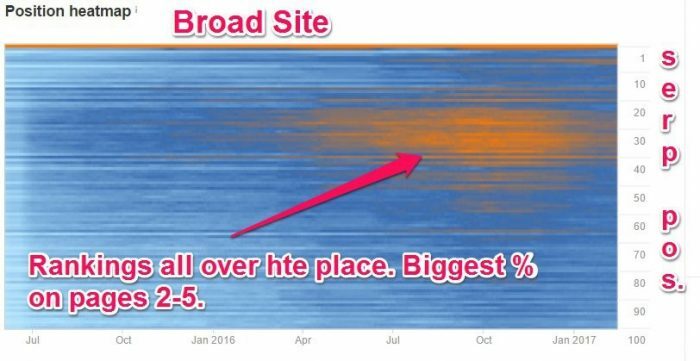 And here is a heatmap for a site in the same market but narrowly covering a specific sub-niche. Here’s the crazy part: in the examples above, the narrow site has much fewer links (and generally of lower quality) than the broad site does. We I noticed this and started looking for it, I saw it everywhere. So, in my view, this is a major con: broad sites have a more difficult time being relevant and therefore require a lot more links to succeed in the SERPs. I’d say going broad is a good idea if you are aiming to make it BIG. Like 6 figures, maybe 7 a month. But it’s true, the first years of these sites are usually not very glorious so be ready to put a lot of work in before you reach the niche’s potential. Narrow niches = covering a sub-niche of bigger market in greater detail. Narrow sites are specialists who are good at one thing. 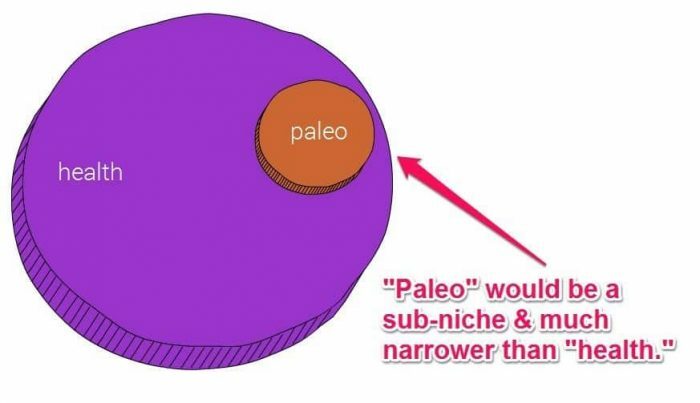 If health is a broad niche, a narrow niche might be: gut health, back pain, or paleo diets. Get more: listen to the podcast where the AH guys break down the strategy of these 3 sites. The primary benefit of narrow sites is the opposite of the biggest drawback of broad sites: narrow sites have very high relevance. The principle drawback of narrow sites is, of course, the low potential. There’s only so much you can write about water filters, for example. They also tend to be more difficult to brand and market. Should you go broad or narrow? Whether you go broad or narrow is going to depend on the context of your skills, resources and where you are in the site development cycle, but the general answer is mostly the same: start narrow and slowly go broad. We’ve found this is the best way to leverage the advantages of both narrow sites and broad sites. Let’s expand that briefly for a few contexts. For new site builders, we recommend starting with one or two sub-niches. Get them working; then, as the site starts to earn, create another silo with the next-closest related sub-niche. For example, you might start a site by focusing on paleo content. Because all the content on the site is hyper-relevant to each other, you’ll be able to rank with less marketing effort. 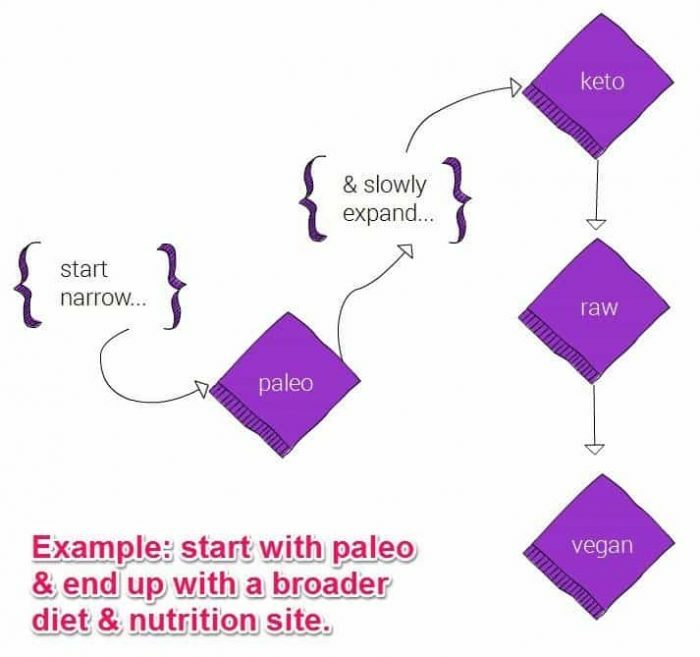 If that starts working, you could then expand into related areas like keto, raw diets, and veganism. Because these sub-niches are all related, it shouldn’t be too tough for Google to understand the relevance. If you want to grow further and decide it would be a good move to go even broader, you might expand into related fitness topics, like yoga. This is why we recommend to pick branded, broad domains even if your site is only going to cover a narrow topic at the start: you’ll leave yourself room to grow. In short: brand broad, write narrow at first then expand when you’ve gained some traction without a need for rebranding. 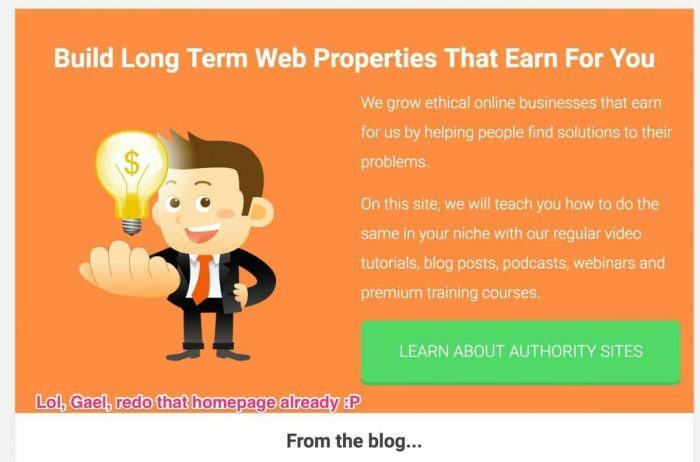 If you have an existing narrow site–and if that site is working and earning money–you can essentially treat it like it’s simply the first silo of a broader site. Of course, the most common obstacle is that your narrow site may already be branded narrowly. If that’s the case, it often makes sense to rebrand. 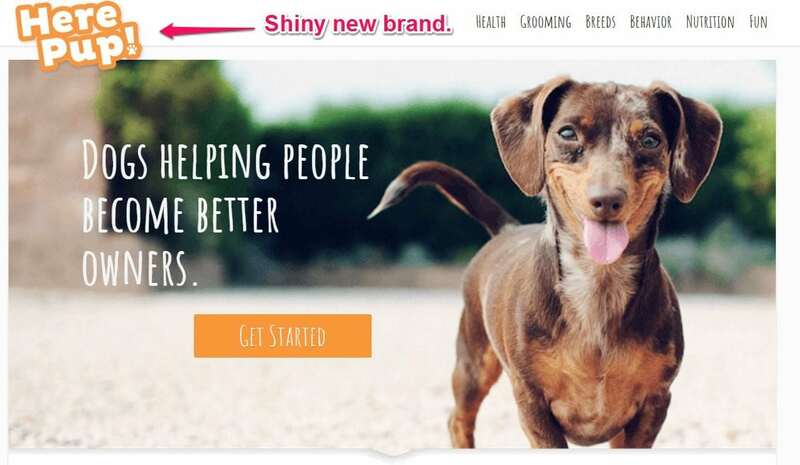 In other words, if you’ve got a site reviewing blenders–bestblenderreviewhq.com, let’s say–you could simply rebrand into something like happykitchen.com, use blenders as your first silo, and then build out others that cover other kinds of appliances or recipes or whatever you thought looked like a good opportunity. I was actually forced to rebrand my site because (as mentioned above) I’d accidentally picked a brand name nearly identical to a major company in my space. I went through to process of rebranding a whole site, and I honestly think the new brand suits the site much better. 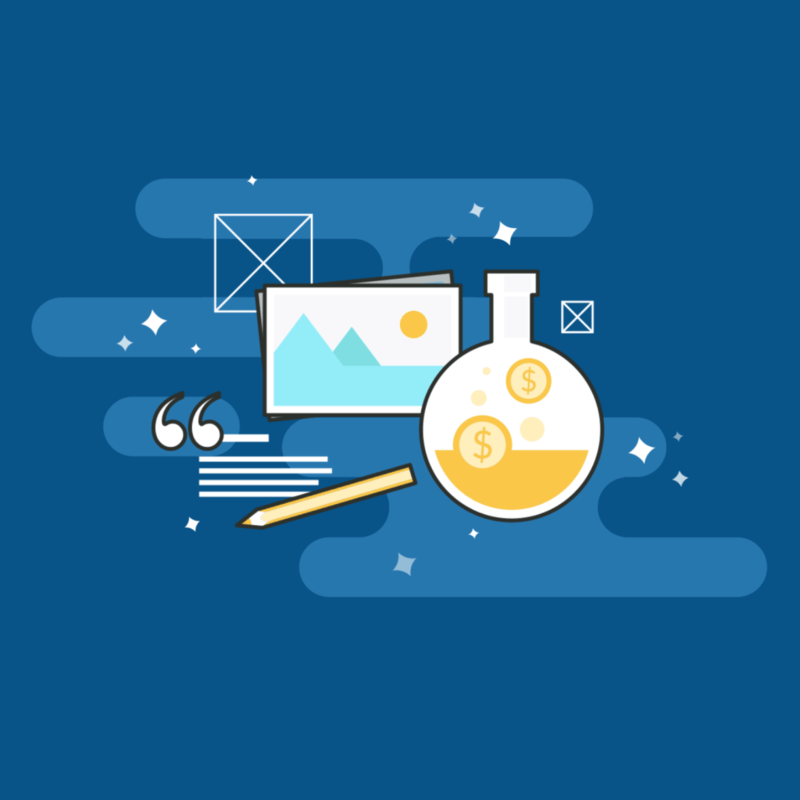 Whether you’re starting a new site with a narrow focus and slowly going broad or you’re taking an existing narrow site and expanding it, good technical SEO and proper siloing is critical. Narrow sites win on relevance because of their tight themes. So, if you’re going to have multiple themes on your site (multiple subniches), you must silo them to retain relevance. If you don’t, the process of going from narrow to broad (and taking advantage of each) becomes more or less pointless. Let us know in the comments if you want a blog post on that topic :). Angles = tackling a market from a specific point of view or for a specific audience. Health for moms. Cars for new drivers. Gaming for women. That kind of thing. Most of the time, taking a good angle works best when tackling bigger markets and starting broader sites. If you do with with sites that are already narrow, it usually just seems kind of silly (e.g. blenders for single dads). Angle: Fitness stuff for nerds. And he really did make it for nerds. He even hired a bunch of them. Here’s his team. And this angle was tremendously successful. 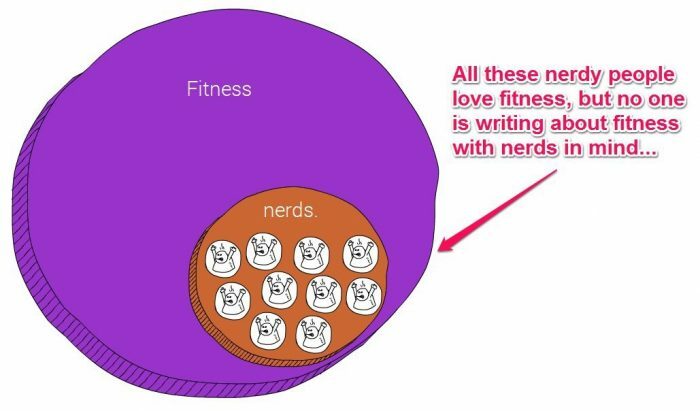 According to SimilarWeb, NerdFitness gets around 2,700,000 visitors per month. Angle: Nutrition for high-powered professionals. As far as I can tell, BulletProof started as a weird hybrid of nutrition and personal development for high-powered professionals. 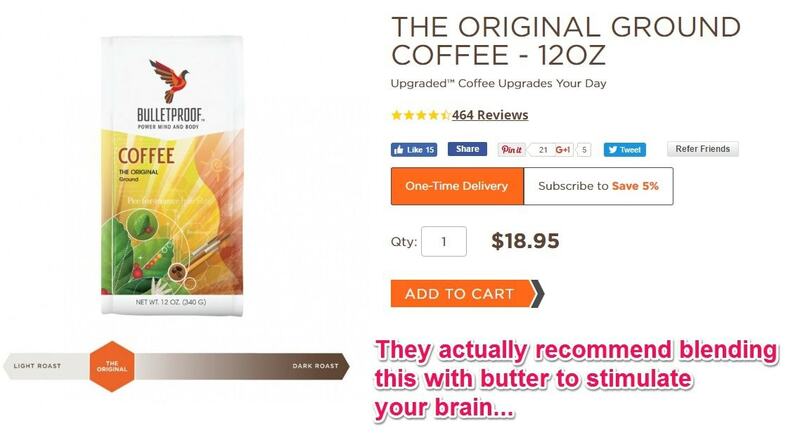 They leveraged this clever angle into a series of products, starting with something they call bulletproof coffee. In other words, this is about as broad as a site can possibly get, but because of a clever angle, they were able to grow into a business that generates over 2,000,000 visits per month (and probably millions of dollars in revenue). Angle: Extremely detailed meta-analysis of scientific studies to provide the best possible answers to the layman. I love Examine.com. Mostly because it was started by a Redditor (Sol Orwell) who wanted to write information for Redditors. And if you didn’t know, Redditors are the single most fickle, pickiest group of people on the planet. They’re ruthless fact-checkers and they’ll bust your balls over any mistake. 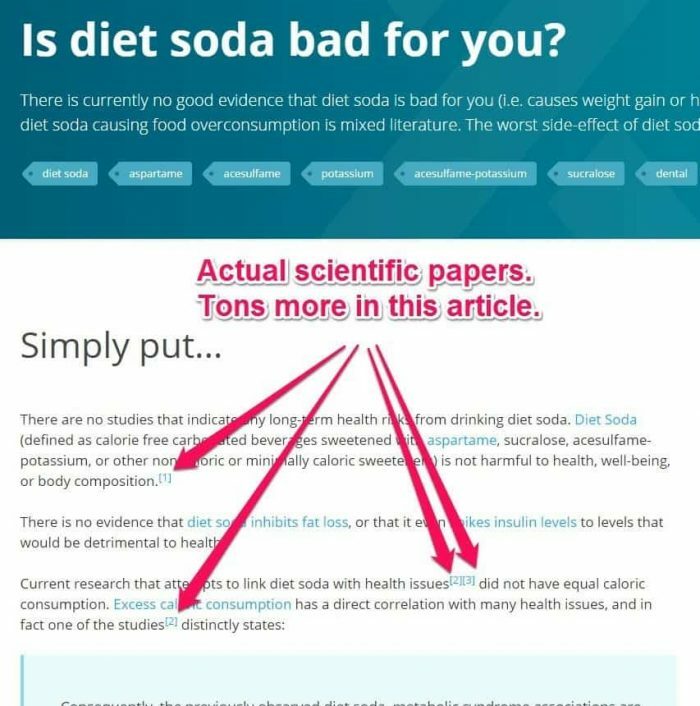 The result was Examine.com: perhaps the most ridiculously exhaustive analysis of the most common questions in the health and fitness world. And it’s not because the content is overly long; it’s because they find, read, and analyze the best possible primary sources. As a result, it became the go-to source for nutrition and fitness information in r/Fitness, the largest fitness community on Reddit. The site now generates nearly 3 million visits per month and is worth 7 figures. Yep; this very blog is an example of making a big market small by taking an interesting angle. When Authority Hacker was founded, “niche sites” were all the rage. I can vouch for that because I was right in the middle of that rage, working at Niche Pursuits, talking about how to build a bunch of grey-hat niche sites. Gael and Mark realized there was a serious gap in the market: independent site builders who were focusing on BIG, white-hat sites. As people started to realize their sites were going to be slapped and/or would never grow, the market trended to blogs like this one, and Gael and Mark were already out in front of that trend. Needless to say, this site has grown alot since then, is a successful business, and has an awesomely active and tightly knit community. Picking a good niche can, in some cases, have a similar effect as starting in a narrow sub-niche and slowly going broad: it effectively makes the niche smaller. It also creates freshness. Examine.com, for example, did something no one else was doing, and because it was so fresh, they were extremely marketable. First, it’s hard to find a good angle. You can’t really just pick one willy-nilly. There has to be an actual need (or gap) in the market. Secondly, it’s risky. If you’re going to spend time picking an angle, it’s probably because you’re planning to go broad, and if you go broad and your angle fails, you’re likely going to meet all the resistance broad sites usually face; in other words, a failed angle is about as helpful as having no angle at all. That said, if you can find one, it can be immensely powerful. I REALLY like angling new sites these days. Mostly because you can create that small community feeling but also give a real mission to your site that’s not overly generic. For example Nerd Fitness can say they want to fix people’s posture and arthritis issues and get brands on board with that because of their angle, get investment, build products etc. It would be a lot harder to do with Health Ambition that is admittedly more general. All of that PLUS you get the opportunity to cover any product in your large niche from your angle so the affiliate opportunities are excellent. 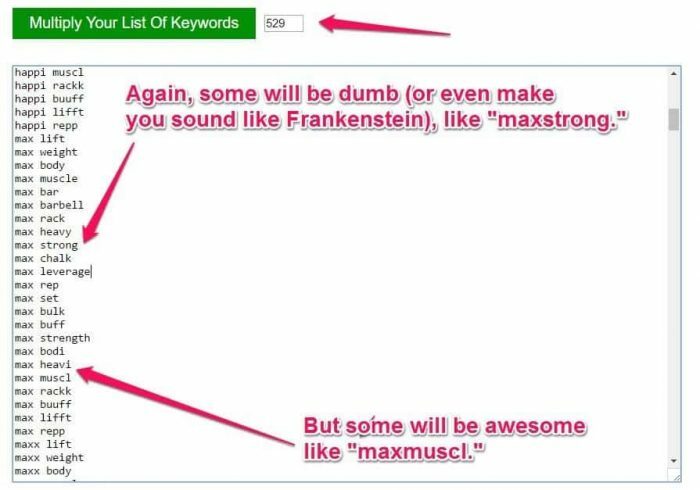 I’ll cover how to search for available domains and check trademarks at the end, but first, let’s cover how to come up with catchy, general brand name ideas. Let’s suppose we’re starting a hypothetical fitness site and our first narrow silo is muscle building. We’ll use this as our example throughout and see if we can pick a brand name by the end of the article. A good way to find these kinds of words are to search for niche terminology in Google. You can brainstorm or find as many as you want, but usually 15-20 does the trick. Also, if you’re the type of person who likes to check domain availability as you go, check out InstantDomainSearch.com. It lets you check domain availability quickly without page loads. Purposefully misspelling words is a cheeky way to get really popular terms into your brand while still having a chance that the domain name will be available. In the real world, I’d probably come up with a lot more of these, but for the sake of our demo here, this will do. Wombo combo = mashing up multiple words. You can combo your core words with each other, or you can combo them with other words (related adjectives or totally random words seem to work best). I particularly like wombo-comboing the misspellings I came up with. 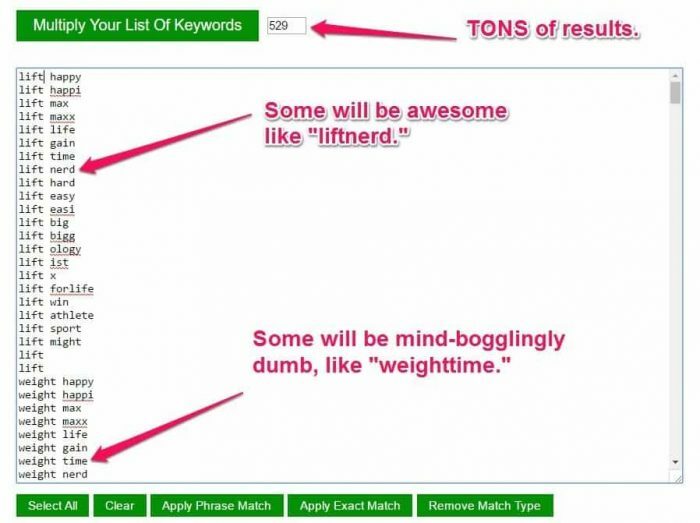 To do this efficiently, my favorite tool is CleverClick’s keyword multiplier. 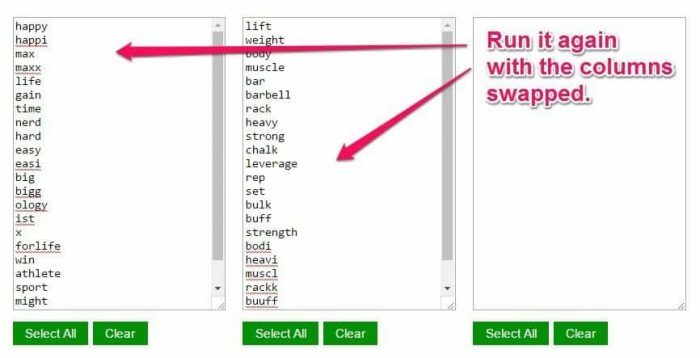 You’ll want to put your core words in one column and your combo words in the second column. Run it, and you’ll get a big list. Then, I usually run it a second time with the columns reversed. You’ll get even more results. Here’s another great tool that will do this automatically: Shopify’s brand name generator. The tool will combo your core word with a bunch of other words. The coolest part is that it only returns .com domains that are available. You’ve probably heard that you should never, ever pick any TLD other than a .com. While that might have been true several years ago, and while you want to stay away from TLDs associated with spam (e.g. .info, .biz), it’s becoming less important to have a .com domain as web users become more savvy. 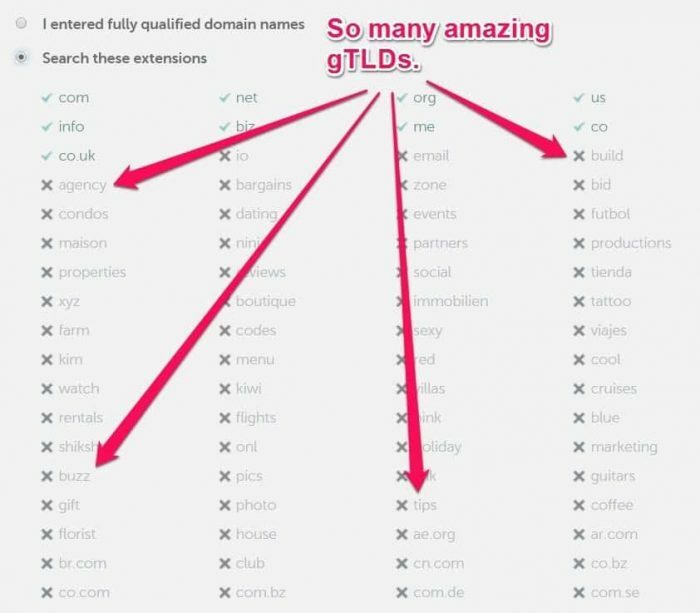 And if you move away from .com, you can sometimes find some awesome brand names, since the International Assigned Nubmers Authority (IANA) has approved over 1,000 generic TLDs (gTLDs). To find them, go to Namecheap.com. On the homepage, in the domain search box, you’ll find an option for bulk search. If you click that, and then click “search these extensions.” You’ll be able to see all the TLDs and gTLDs available for registration. You can search for some combos directly while you’re there, but I usually just browse the list and jot down some ideas. But there are loads and loads of combinations possible, and some of these are super fun. 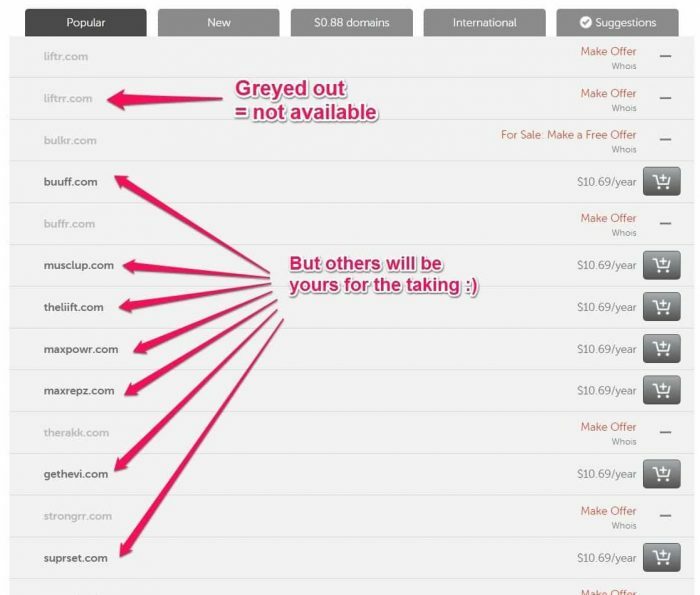 Remember the Namecheap.com bulk domain checker? I use the very same tool to check the availability of large lists of domains. When I sit down to brainstorm a new brand, I’ll have hundreds of ideas, so I’ll have to run multiple sets of 50. Namecheap will then tell you what’s available and what’s not. Before we actually register a domain, we want to check for trademarks. Why? Because we don’t want to have to go through the trouble of rebranding our entire website if some lawyer hits us with a cease and desist for trademark infringement. Then, search for your brand name idea in the search box. Search the exact words as well as other ways it might be spelled. …I asked my lawyer if it was safe to register a domain if the trademark holders ran unrelated businesses. He said that if someone has a recognized online service or product, if you use a similar domain name, even if your service or product is unrelated, they can still use domain dispute processes to claim your domain name if they can somehow show that you are attempting to divert business from them. If your brand name’s domain is available and no trademark is registered, you might just have yourself a winner! Which brand name did I find? 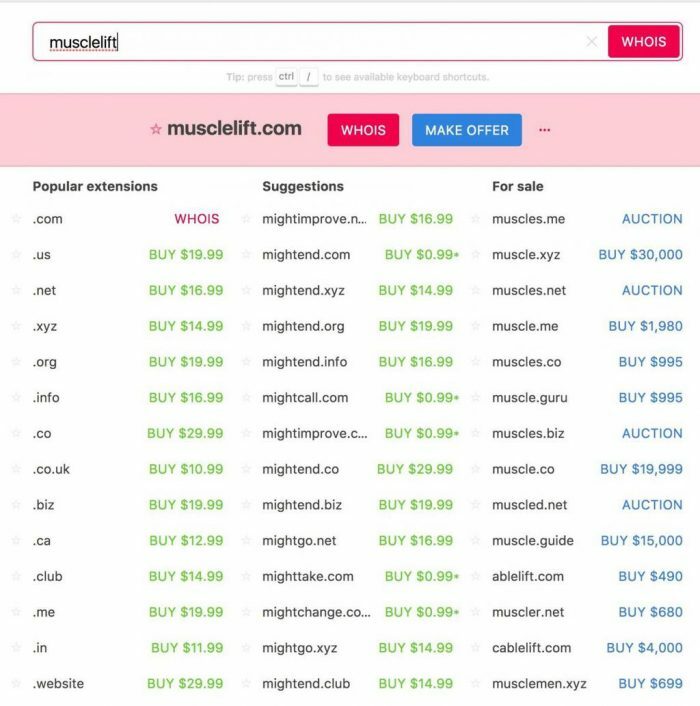 The brand I liked best was musclup.com, a name I found through the misspelling + mashup method. However, there were some similar trademarks already registered. 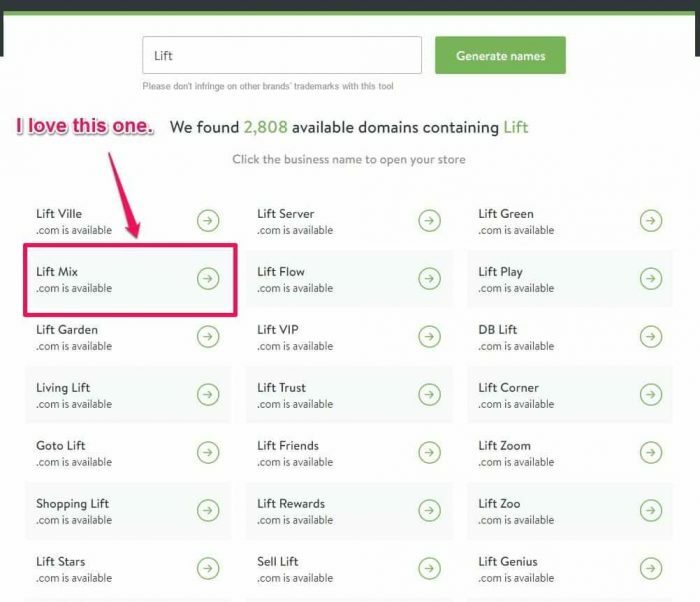 So the brand name I settled on for my hypothetical weightlifting site is: liftmix.com, a short, catchy brand name I found with the Shopify brand name generator. It makes a lot of sense for a fitness site with a weightlifting focus, but that kind of site could easily expand into nutrition and supplements for weightlifters, giving me the freedom to go broader later on. There was one trademark, but it’s no longer active, and there were no closely similar domains that I could find. What do you think? How did you come up with your brand, name, and angle? Let me know in the comments! I’m surprised the other company that sent you the cease and desist letter allowed you to 301 from that domain instead of making you abandon it completely. I remember something about this happening with Pat Flynns first site where he tried to 301 the domain that they lawyers were sending him the cease and desist letters about and they said no go on even 301ing it. I have major anxiety about picking domains for this very reason, especially because it takes so long for a site to really get going with rankings. This article was SO useful for me. Thank you so much. I wanted your opinion on what you think would be a better niche, beauty or hair. I know beauty is broad but do you feel that it is too broad and that just “hair” would be better? Also curious about your opinion on rebranding if my current site has a commercial page and already ranking for “best+product”. When I rebrand I want to put that page on an inner url which means I will have to redirect my current homepage to that inner url. Hence the new site will have no links to the homepage to start with. Is that ok or will I get hit hard? Depends on your goals and resources. If your resources are limited, just go narrow. 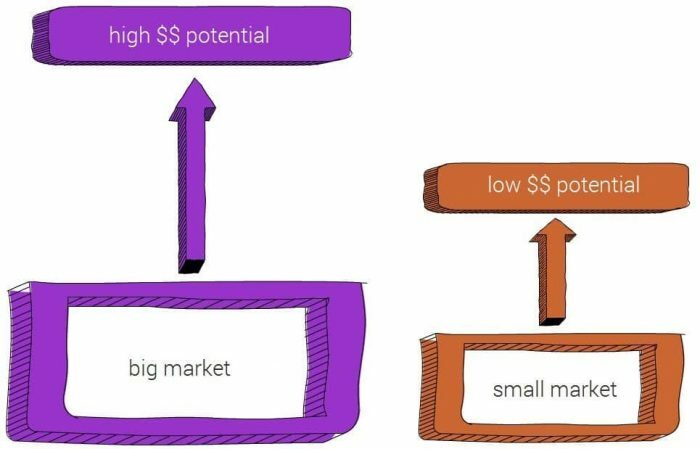 If you want to devote lots of resources, you can start narrow and go big. Usually, I’ll pick a bigger, more general brand and just start narrow. Re: the rebrand: that’s a tough call. That’s a pretty big shakeup. I’d say it depends on how much money that page is making. Typically, with a rebrand, you want to redirect all pages to similar pages in similar locations. Redirecting your current homepage to an innerpage might be wonky. I’ve never done anything like that, but I feel like there’s some risk there. If it’s not making a huge amount of money, it could be worth it. Nice post here I understood all of it thanks. Yep, we’re using WordPress and Focus blog by Thrive Themes. What program do you guys use for screenshot and annotation? So I have a few questions about this because I’m running up against something similar. 1. 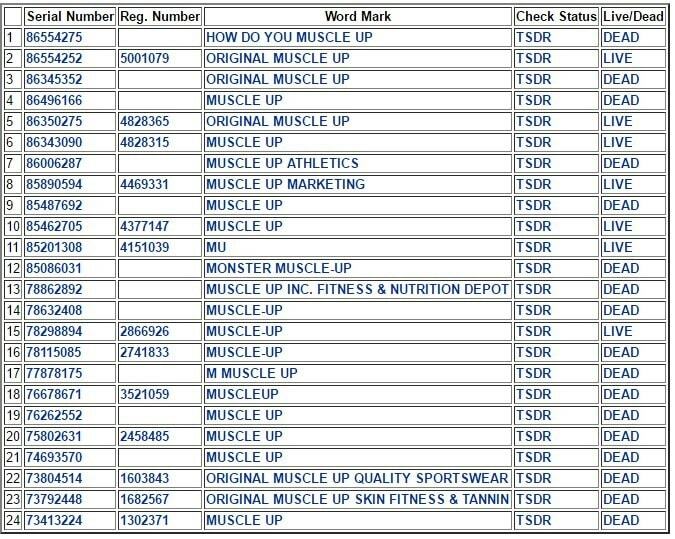 Based on your trademark search, are we to assume that any one of those “Muscle Up” companies could send a “Cease and Desist” to any of the other companies asking them to take their website down? 2. How could so many companies be registered under the same “Word Mark”? Do you think they’re just unaware of one another or don’t care? 3. 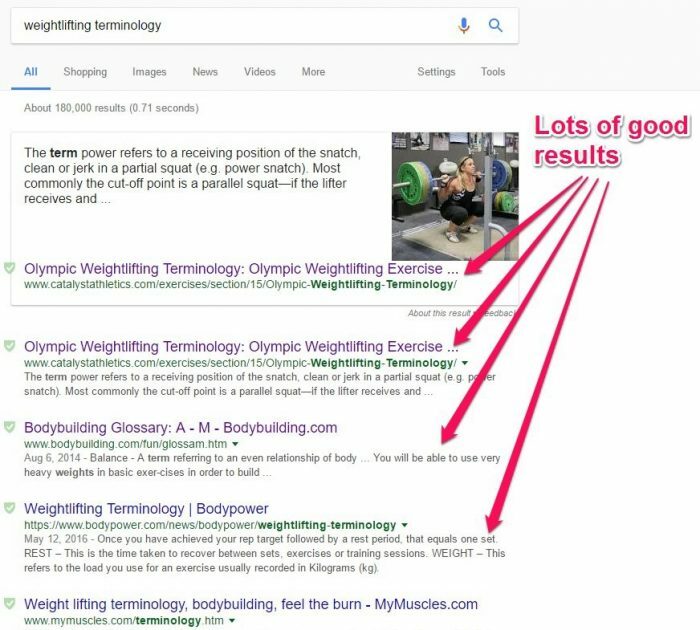 Let’s say the name of your website was instead LetsMuscleUp.com (this is a case similar to mine). In that case none of those other businesses would have shown up in your search for “Lets Muscle Up”. Would that be different enough to avoid this problem? I’m really not sure, which is why for our theoretical case study, I chose a different domain just to be safe. I want to reiterate here that I’m not a lawyer. I do know that Chris Guthrie and (I believe) John Lee Dumas had to change their domains because they included included the word “entrepreneur,” and Entrepreneur.com sent then CnDs. I don’t think this sort of thing is common, but it did also happen to me (see story above). I appreciate the response. Would you say in your experience it’s mostly large brands with big budgets that have the resources to pursue these types of things? In my case, the only similar business is for a local personal training service, whereas mine will be an affiliate site selling fitness equipment. I’d say there are risks, but unless you are competing directly (like I pretty much was with my dog site), it’s probably very rare. And yea, small guys are less inclined to pay legal fees for sure. Again, I’m no lawyer, but it’s likely rare. I have an interesting suggestion for a future article….. If you guys feel it’s better to create multiple pages targeting each phrase or just create one page and rank for multiple variations of that keyword? I was looking at this amazon affiliate site, comfyoffices DOT com and he managed to rank his homepage for tons of keywords including “best office chair”, “ergonomic desk chair”, “best computer chair” etc and “best executive chair” by just incorporating those phrases in the text…. So is that commonly known to work? 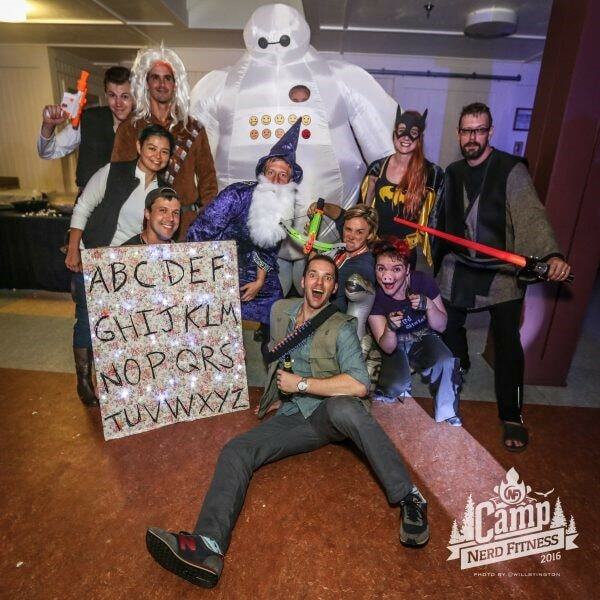 I think most marketers would make “best executive chair” and “best desk chair” as new pages…. since it’s very different from “best office chair” but somehow this guy managed to rank for everything? Honestly, you can do both, but we can look at what would be the most efficient. Are all of the pages on HealtAmbition silo’d and are all the pages “posts” or “pages”? 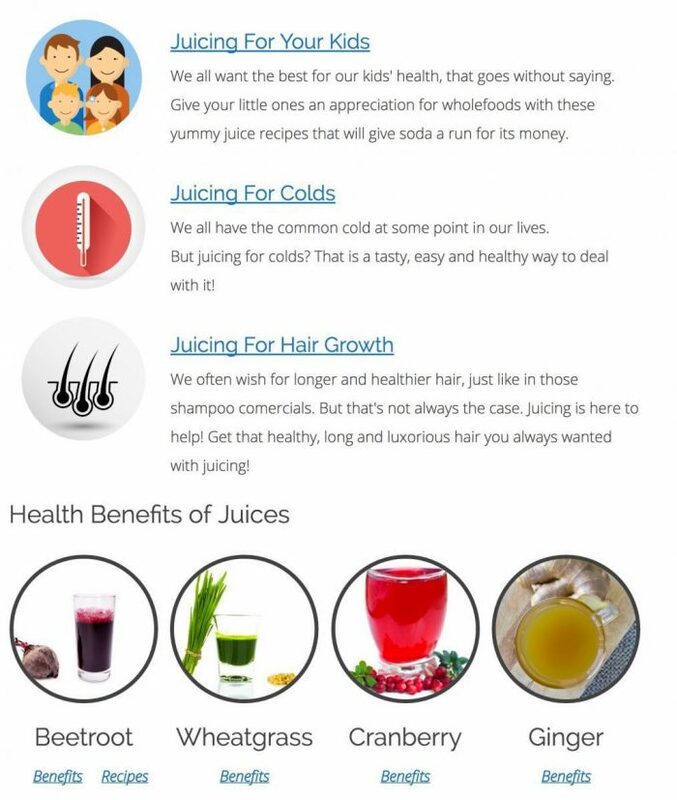 For example, the homepage links to https://www.healthambition.com/many-benefits-of-lemon-water/ Is this a page or a post and is it a part of a silo? Nope they’re not all siloed, the reason why is we sucked when we started ;o. Great tips Perrin. It’s nice to hear your personal experience because we learn a lot from it. 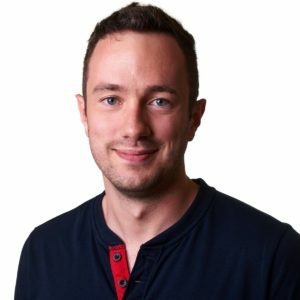 Anyway, would you suggest rebranding (changing domain) a one year old site? Wouldn’t it confuse the readers? is siloing long term? or is it just a current trend and in 1 years time google will change something and siloing will be irrelevant. Siloing; yes please write an easy to unsertdand article on this! The basics are easy to understand. But what do you do with pages that are quite general and fit into multiple silos? Can you move pages between silos easily? Create article by the way Perrin!!!! Thoroughly insightful. I might have to reconsider the name of my website. One point I’m not entirely convinced in your post is about .COM extension. While it’s true that there’s more and more people go with .IO, .GURU these days and you have better chance coming up with good name, but I believe .COM is still the best in domain name. All you need is to creative a little bit to get the brandable name with .COM (One suggestion is to combine your keywords + pet name). Finding domain name is addictive actually. Do you think its a big risk to change a domain name to something else? My site is 3 years old and the site is getting decent traffic but the domain name is limiting and sounds a little spammy? If you feel like it’s prohibitive to growth, it could be worth it. Just have to make sure you do it correctly (301’ing correctly, changing in webmaster tools, etc.). your post help me lot. thank you for providing great info. Awesome content. I took very important notes that will definitely get me out of my bad position. Good stuff! It would be awesome to see an article on siloing. Awesome article as usual Perrin! I’ve been reading a lot about site relevancy lately too and have really noticed its power in the SERPS. Because of that I was wondering if people were going to start moving back more to the old “micro-niche site” model; but without all the grey hat stuff. Also, is it true that siloing can really restore relevancy to a large authority site? I’d definitely love to hear more about it! Yea the main benefit of silo’ing is relevance (and good UX is usually a big bonus). However, it’s extremely difficult to immplement with established broad sites. It really is something that needs to be planned in detail from the beginning. Also, if you go dinking with the structure of a site that is already earning, there’s a lot of risk if you screw it up somehow. That’s why herepup is largely un-silo’d still. 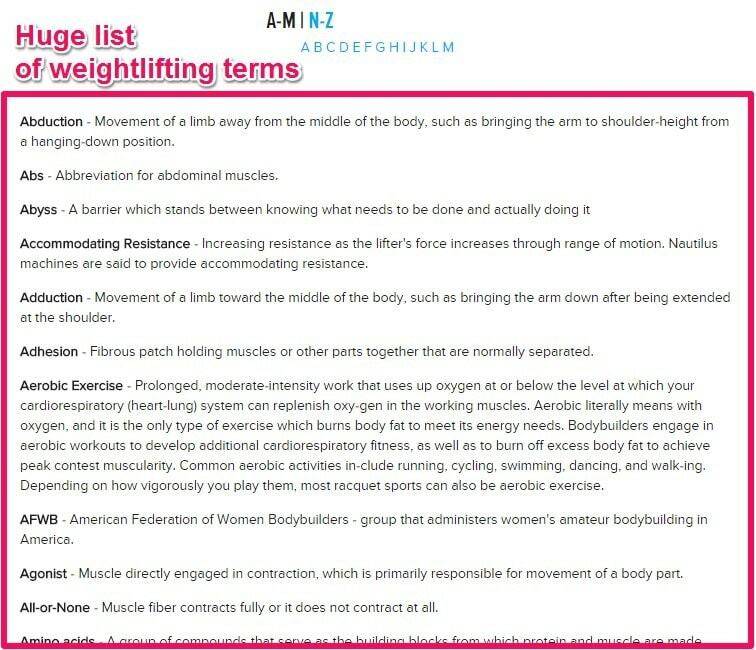 I was wondering so for musclup.com, if the trademarked names are muscleup.com (muscle up) would that be counted as the same? Or would we still have no issues with it? Of course, to avoid legal fees, it’s 1000x easier to just come up with a different brand name that doesn’t have any trademarks registered. Regarding about the trademark issue, assuming we found an available domain name with no trademark registered, do we have to register trademarks for the domain name that we have found? I’m not a lawyer, so I’m not sure. My understanding has always been that you can’t until you’ve got an actual brand doing real commerce. It also costs $355 + legal fees, which is usually not worth it for new sites. Excellent post, Perrin. I heard about trademarks problem before but your post gives us the way to avoid all that problem. Another thing I like your broad/narrow niche selection way. I did not think about angling before. It was a great read. Wow That was one just amazing helpful article… learn alot thanks for the guide. i think i’ll just have to stick with narrow niche that will be helpful for me. Awesome post as usual. Keep up the good work.